Shelly: Currently, I spend the majority of my time teaching courses to 1) healthcare providers and yoga therapists on ways to integrate yoga into their sessions to enhance or complement rehabilitation and to also address professional burnout and to 2) yoga teachers to help make their yoga classes more suitable, safe and accessible for people living with a variety of conditions and abilities. I also provide one-on-one sessions that integrate physical therapy and yoga (PhysioYoga) for individuals with a variety of conditions with a focus on persistent pain (chronic pain) and pain related musculo-skeletal conditions, acute orthopedic injuries, pelvic floor dysfunctions and breathing pattern disorders. I also enjoy teaching yoga classes (outdoors when possible) to the general population; especially sharing practices with those who have never tried yoga before because they have felt intimidated, fearful or uncertain about whether or not they could practice yoga. Accessible Yoga Blog: Can you share a teaching experience that stands out? Shelly: Peter* was a client I was working with that suffered from persistent (chronic) back pain after multiple spinal surgeries over the past 15 years. He held his muscles very rigid and tense, especially around his ‘core’ or trunk area. He was often told that he needed to keep his spine stable and protected. His breath pattern was rapid and shallow and he held his breath with excessive muscle tension when he transitioned from one position to another, especially during sit to stand, getting up and down off the floor, rolling to and from supine lying and getting in and out of his vehicle. We had been working on breath and body awareness practices, so that eventually he could regulate the breath to be calmer, and the body to have less muscle tension, so that he could move with more ease and potentially less pain. He was always very afraid to go into any position that required spinal flexion. At one point, when he felt ready and safe, I offered him the option of getting into an adapted child’s pose, with tremendous (and luxurious) support from several props for his entire trunk to rest on, as well as support for his arms so that he was not having to support anything with internal effort. I then offered him a simple mantra to repeat silently to himself on inhale and exhale. Inhaling he repeated: “I am Safe”; exhaling he repeated “It’s Ok to Let Go”. After a short period of time (approximately 2-3 minutes maybe) Peter was able to fully relax into the posture. For the first time in 15 years, he said that he felt a release both emotionally and physically. His musculature that had been so tense and guarding for so many years had finally let go for the first time; he felt safe and calm (and he was in a slightly flexed position, which he had not allowed himself to be in for almost 2 decades). I noticed his breath pattern had changed also: the rate was slower and it was a relaxed pattern (less effort was used by his upper body, and I could see the rhythmical movement in his lower ribs, spine, lower abdomen and side waist that had never been there before). He was mentally, emotionally and physically calmer and was able to move with much more ease and less pain when he came out of the position and stood up. His gait pattern had changed: less trunk and abdominal bracing and more natural and nuanced movement patterns were noted. The effects of his experience were even noticeable on his face. His jaw softened. His eyes softened. He looked calm and peaceful and was even able to smile in a way I had never seen before. A sense of peaceful energy was felt by us both. We both expressed and shared some tears of joy and it was a memorable moment for him (and me). He still has his ups and downs with managing pain and moving/breathing in guarded ways; but he is more aware of when he does add tension when it is not needed, and he can change his experience, if he is mindful about it. His experience in a safe and supported child’s pose, with the added mantra, seemed to shift something in Peter that allowed him to explore trusting and letting go in a safe way. This appeared to carry over and help him move with less pain and more peace and ease in other aspects of his life. *Peter’s name has been changed in order to maintain confidentiality. Shelly: I have witnessed yoga practices and philosophy to be tremendously valuable and beneficial for people who live with a variety of conditions perhaps because of yoga’s well-rounded biopsychosocial-spiritual approach of helping the individual in the context of the surrounding environment, instead of ‘treating’ the isolated diagnosis. Many people are interested in yoga for overall health and wellness and more and more people are turning to yoga to help them during times of injury, pain, suffering and recovery. As a physical therapist (PT), I found myself well positioned to contribute to the integration of yoga into healthcare to enhance the rehabilitation experience for people. For the past 20 years, I have felt a growing responsibility as a PT/yogi to make yoga more accessible, safe and effective for people living in pain, with injuries or other health concerns. Mainstream or traditional yoga practices are not always suitable for people with injuries or who suffer from persistent (chronic) pain; often these practices can exacerbate their pain or injury, if not adapted appropriately. Shelly: I am co-authoring a new book, Yoga and Science in Pain Care. One of the chapters is on the science surrounding self-compassion and the incredible value that self-compassion has on our overall physical, psychological and social health and wellness, as well as how self-compassion practices can help reduce the pain experience for people living with pain, and may also help reduce the risk of professional burnout for the health provider. I look forward to sharing the research and also my own transformative experiences with self-compassion practices. I’m excited to integrate more of these practices into my courses, classes and sessions so that everyone can experience the potential benefits. Shelly Prosko, PT, PYT, CPI, C-IAYT is a Canadian physical therapist and yoga therapist dedicated to empowering and educating individuals to create and sustain optimal health by teaching, promoting and advocating for the integration of yoga therapy into modern healthcare. She is a respected pioneer of PhysioYoga, a combination of physical therapy and yoga. Shelly guest lectures at medical colleges, teaches in numerous yoga therapy programs, speaks internationally at yoga therapy and medical conferences, offers onsite and online continuing education courses for healthcare professionals, yoga therapists and yoga teachers, and offers workshops and individual sessions for those suffering from a wide variety of conditions, including pelvic floor dysfunctions and persistent (chronic) pain. 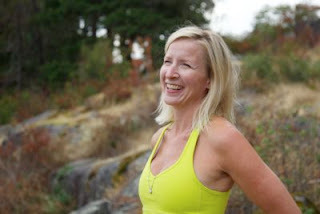 Shelly has extensive training and over 20 years of experience of integrating yoga into healthcare and considers herself a lifelong student, truth seeker and change maker. Please visit www.physioyoga.ca for more info. There are more than 300 million yogis in the world today, according to the Global Growth in Yoga video produced by the International Yoga Festival in Rishikesh India. In ancient times, yoga was restricted to the upper classes. Now many people enjoy the physical, mental and spiritual benefits of their yoga practice. Many recent studies suggest that yoga can help cope with anxiety, depression and distress and in general improve quality of life (1, 2, 3, 4). The ability of getting in touch with our body and our mind can be a powerful tool to deal with difficult physical and mental conditions and a growing number of scientific researches are highlighting the role that yoga can play in improving quality of life of people living with chronic diseases and disabilities. Despite these benefits, not everyone feels welcome in a yoga class. Sadly, many classes simply are not accessible to students with disabilities, health problems or chronic illness. Some people don’t feel welcome in the yoga world because of age, class, race, size, gender or sexual orientation. Additionally, yoga teachers may lack the training to make their classes truly accessible to anyone who has the courage to walk (or wheel) through the door. Without proper training, it can be scary to welcome every person who attends class, but this is where we trust our teachers and community to help us expand our knowledge so that we can support diversity across a global community. Accessible Yoga is an international, grassroots, non-profit organization dedicated to sharing yoga with everyone. Our goal is to share the benefits of yoga with anyone who currently doesn’t have access to these practices, including communities that have been excluded or undeserved. Communities without access include people of all shapes and sizes, all colors and kinds. They include people with physical disabilities, developmental disabilities, and invisible disabilities such as chronic illness, emotional challenges, or PTSD. They include people with vision or hearing impairments, walkers and wheelchairs. They are young, middle-aged and senior. They live in homes, juvenile halls, jails, or are homeless. This list reminds us that what we really need to stretch is our own minds and our image of what a yoga practitioner looks like. “The reality is that if you have a body and a mind,” says Jivana Heyman, founder of Accessible Yoga, “you can do yoga”. How Can We Make Yoga More Accessible? One of the first steps is helping yoga teachers become more comfortable and confident in welcoming all people to their yoga classes. The Accessible Yoga organization holds conferences twice a year where international experts offer sessions, workshops, panels, and networking to share ideas and practices. Accessible Yoga training programs guide teachers in how to adapt asana, pranayama, meditation, philosophy, and contemplation to meet the needs of the individual. In addition, the Accessible Yoga organization and sponsors offer financial assistance and scholarships to deserving teachers to attend the conferences. Another step is to help our global yoga community become more diverse. Through an online, global Accessible Yoga Network, yoga teachers can learn from close to five hundred Accessible Yoga Ambassadors willing to share their knowledge and experience. In addition, regional groups share articles, tips & tricks, and images through social media platforms, such as Facebook and Instagram. Yoga is a beautiful gift to the world that we can all unwrap and enjoy. It provides tools that offer us moments of peace and can lead to lives of dedication and fulfillment. We can all be Accessible Yoga Ambassadors by making a commitment to reach out to people without access to the teachings of yoga, and by continuing to practice and embody the teachings in our own lives. See Conferences about our upcoming Accessible Yoga Conference. Don’t miss this opportunity to get in touch with the international Accessible Yoga network! Together we can make a great difference! To get more information and to find out about becoming an Accessible Yoga Ambassador, visit accessibleyoga.orgor send us a message. Marie Prashanti Goodell, C-IAYT & RYT-500, turned to yoga to manage stress more effectively while working as a high-tech marketing manager in Silicon Valley. Now she teaches Hatha, restorative classes and 1:1 yoga therapy sessions at Integral Yoga Institute in San Francisco, wheelchair yoga at Laguna Honda Hospital and Rehabilitation Center in San Francisco, and stress management at the Preventive Medicine Research Institute championed by Dr. Dean Ornish. Marie incorporates many dimensions of yoga to support healing and wellness including physical postures, breathing exercises, deep relaxation, meditation, imagery and visualization, gentle touch, Reiki, mantra and yoga philosophy. Marie is a board member of the IYI San Francisco and the Accessible Yoga Organization. 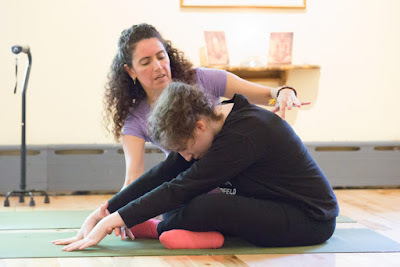 Marsha: I teach people who work directly with amputees, for example; prosthetists, physical therapists, occupational therapists, and yoga teachers. I teach at conferences and events that have a focus towards amputees. I also offer online trainings in my method, Yoga for Amputees®. Marsha: One experience that stands out occurred during a Yoga for Amputees® workshop that was open to both amputees and caregivers. One participant had been a below-elbow amputee since childhood and had rarely worn a prosthesis. We practiced a meditation on being whole, using a technique of gentle breathing and meditation. She sobbed through most of the class and, afterwards, confessed that she had never seen herself as whole. For the first time in her life, she stood in her difference and was able to connect more authentically with her fellow classmates. Marsha: I feel like my students chose me. Even though I am a below-knee amputee, I had always taught non-amputee students. Although I often worked with unique populations, it was my own need to prove I was ‘normal’ that kept me from my fellow amputees. In 2000, I started to get many requests from amputees so I founded Yoga for Amputees®. Now, I’ve trained Yoga for Amputees® teachers from all over the world. Marsha: I love sharing Yoga for Amputees as well as my personal story. I decided to share my personal story in my recently published memoir, From the Roots: The True Story of How I Beat Death and Learned to Live. By sharing my decision to find grace, humor, and joy in the worst of circumstances, I hope people find the power of possibility. I am currently editing my forthcoming book, Yoga for Amputees. I am also excited to train clinicians in a clinical-based patient model. I see potential to make a big difference in amputee patient outcomes through yoga by offering services from point of limb loss through early rehabilitation. Marsha Therese Danzig, Yoga Teacher, RYT 500, M.ed Harvard, is a below-knee amputee and Founder of Yoga for Amputees® by Marsha T Danzig, a program to help amputees move forward in their lives through the healing power of yoga. Marsha lost her leg in 1976 to Ewing’s sarcoma. She has been teaching and training others in yoga for almost two decades. She is passionate about imparting her lived experience of bridging the chasm between suffering and joy through yoga and embodied movement. This post was edited by Gita Brown.